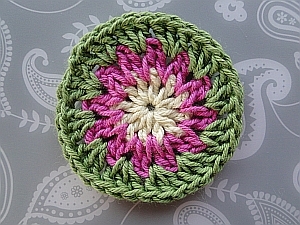 The Flowery Cosmic Crochet Coaster! 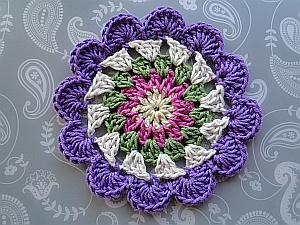 This is a circular variation of the original Cosmic Coaster, and I'm very pleased with it! 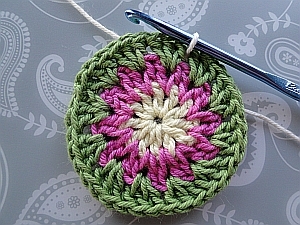 This is a 6-round pattern, using 5 colors of Lion Brand Bonbons, a sports-weight yarn. 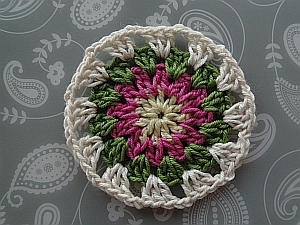 Crocheted with a 3.75 mm (F) hook, the coaster measures 4½"/11 cm across. The first three rounds are worked in exactly the same way as the Cosmic Coaster, where I have written a full photo tutorial. The only difference is that I have used three different colors for these first three rounds. So if you need to see the photo tutorial for the first 3 rounds, do check out that page! I've added photos below from the end of Round 3. Join with a ss into top of 4 ch. Tie off. I tighten the knot gently, and weave this end from front to back under the top two loops of the next stitch before weaving into the back. 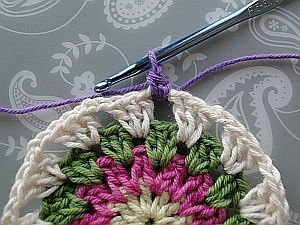 Join color B into the space between any 2 stitches. I made a slip knot, then pulled the loop through to the right side of the work. 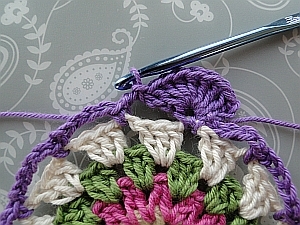 Ch 3 (counts as stitch at start of round for this pattern); dc into same space. (2 dc into next space between stitches) 11 times. Join with a ss into top of 3 ch. Tie off. 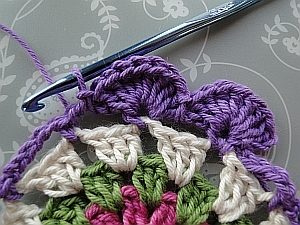 Join color C between any two stitches that are worked together into a space - so, into the "V" shape; ch 3, 2 dc into same space. (skip next space, 3 dc into next "V" shape) 11 times. 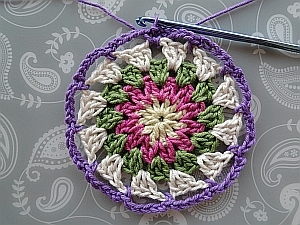 Round 4: In Round 4, a "space" means the space between each group of 3 stitches. ch 3, 2 dc into same space. (ch 2, 3 dc into next space) 11 times. ch 2, ss into top of 3 ch. (ch 5, sc into next 2-ch space) 11 times. Twelve loops around at the end of Round 5. I continue in the same color for the next round. (8 dc into next sc; ss into next 5-ch space) 11 times. To finish, join with a ss into top of 3 ch.